ACIAR’s project has been working with the local community and the staff of the Kabhre District Forest Office in an attempt to revitalise this promising community forestry enterprise. 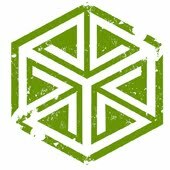 The aim of this research is understand how the local institutions deal with conflict and ultimately to strengthen the institution so that it can continue to operate a commercial enterprise that generates substantial returns to the local communities from better management of their natural resources. 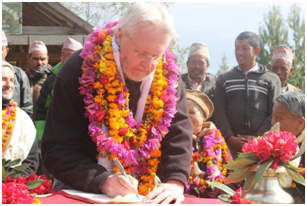 Following the mid-term review of the ACIAR forestry project, Australia’s Ambassador to Nepal – H.E. Glenn White agreed to make a visit to the Chaubas area with the project staff. His visit on 27 January generated high level support from senior government officials from the Department of Forests and demonstrated to the local community that Australia is committed to helping them generate enhanced livelihoods from their community forests. 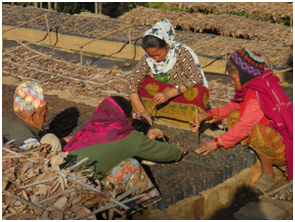 Between 1978 and 2006, Australia funded the Nepal-Australia Forestry Project (NAFP) which pioneered the development of community forestry approaches in Nepal. In the 1990s, agricultural land was a scarce resource for many farmers in the Middle Hills. While their subsistence agricultural systems depended on inputs from forests (such as leaf material and fuelwood), generally only the land rich farmers grew trees (on outward sloping terraces) and most families relied on collecting forest products from community forests. Consequently, much of landscape was relatively devoid of trees. Twenty-five years on, in many villages more than half the men now work in other countries, so a lot of agricultural land is underutilised and trees are very much more common in the farming landscape. In 1980, NAFP ran its first training course for nursery workers (naikes). Khadga Bahadur Kharel (from Chaubas) and Tek Bahadur Tamang (from Chautara) both participated in that training, and afterwards, managed tree nurseries in the project area. Khadga became a field assistant with the project and worked for the project until it finished in 2006. Tek continued his naike work at Chautara until he retired. In January 2015, I visited the Chautara nursery with Khadga and we met up with Tek Bahadur, who is now 71 years old. 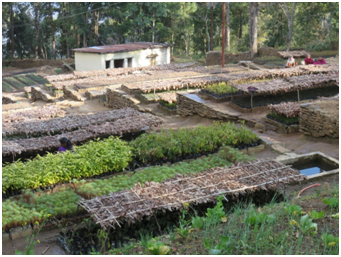 The District Forest Office staff had recently brought Tek back to work at the nursery because the annual production of tree seedlings had dropped substantially. Under his guidance, the local nursery staff improved their work and once again the nursery is producing about one million tree seedlings each year for distribution to local farmers. Now that is a very good example of long-term impact that came from a simple training program conducted 35 years ago. Research brings a good news. 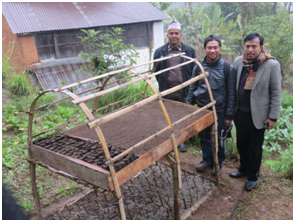 The farmers of Nepal's are benifited from the research.They teach new nursery bed technology from the specialist. It is very helpful for every farmer.